In modern times, we are in such a rush and have such a DO! DO! DO! attitude, that we forget our bodies. We ignore them, push them to the limits, and expect them to do what we want them to do without asking them what they need to get the job done. If you listen, your body is often trying to have a conversation with you, but during a hectic day, it’s easy to keep ignoring its pleas. Here is an example of my day before I began practicing body awareness. What might alkaline water do for you? Try it! H2O Alkalizer’s countertop water ionizer with pre-filtration system is half price! Hurry to place your order. Stock is limited and the offer ends with the summer. At a certain stage of development, a human embryo can hardly be differentiated from that of a dolphin. Humans beings begin with a small tail and also feature folded neck structures, which in fish turn to gills, but in humans develop into jaws. That is why the rate at which the oceans are becoming acidic is alarming. National Geographic states that the oceans absorb about a third of human-created carbon dioxide emissions. Over the past 300 million years, ocean pH has been slightly alkaline, but that is changing rapidly. Ocean acidification is putting ecosystems at great risk. The human body is likewise in danger when too much carbon dioxide and acidic waste builds up in the blood. The acidosis puts the organ systems at great risk. 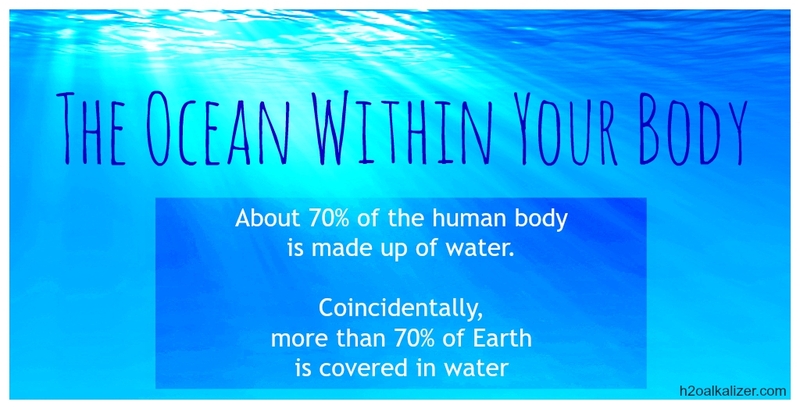 “About 70 percent of the human body is made up of water and, coincidentally, more than 70 percent of Earth is covered in water,” this NASA fact sheet states. Whether it is the oceans of the world, or the oceans within your body, water is the matrix of life and maintaining pH balance is crucial for survival. Receive these free alkaline food charts. Buy a water ioniser at half price. What will you feel like when you drink alkaline water? I’ve suffered from acid reflux for years. It became so uncomfortable, I went to see a doctor. I had an endoscopy and she discovered I had a hiatal hernia and an ulcer. I took PPI’s to allow the ulcer to heal, but the hernia still allowed stomach enzymes and acid into my oesophageus so I had to continue the medication. Now that I drink alkaline water between meals, my GERD has all but disappeared, and only acts up when I’ve overindulged in trigger foods like coffee, wine, and fatty meats. I’ve stopped the daily medication and only take over the counter antacids for the occasional times I veer off my alkaline diet. Since drinking alkaline water, I notice my mouth feels cleaner throughout the day. My gums are pink, my teeth feel smooth, and my breath is fresher. My eyes used to sometimes look dull or bloodshot when I was tired, but now that I drink alkaline water the sclera (the white part) is always clear, bright white. I’m not sure what the reason this for is, but I sleep deeper and better since I began drinking alkaline water. I’ve always maintained a rather demanding workout routine. I would suffer regular soreness and stiffness whenever I overdid it. Now that I drink alkaline water, I don’t feel the lactic acid build-up and DOMS the next day like I used to. I noticed greatly reduced bloating, moodiness, and pain. This was a pleasant surprise! I lost over five pounds since I began drinking alkaline water, and I haven’t changed my diet at all. In fact, I’ve been indulging in some acidic foods like wine, chocolate, and bread. I’m not sure how it happened. I think some of it was water weight, because when I first began drinking alkaline water I would urinate a lot. Now I’m maintaining an average five pounds less without any extra effort! These were my personal experiences and I am thrilled with the results. No wonder movie stars and celebrities drink alkaline water for health and beauty. Alkaline water will affect everyone differently, but I highly recommend trying it to see what it can do for you. Buy a water ionizer for half price! This will save you thousands of dollars over the other brands, which are insanely expensive. Click here to buy your alkaline water products. How are you feeling now that summer is quickly drawing to a close? Are you staying hydrated, fit, and healthy? I started a new routine with alkaline water a few months ago. I’ve already noticed that I have brighter eyes, clearer skin, and I enjoy a much deeper and longer sleep. These are benefits I wasn’t even expecting. Drinking alkaline water between meals has also alleviated my acid reflux, which I had all but given up on curing. I lost seven pounds without having changed my diet. This is odd because I actually have been exercising less, so I can only figure it’s because I’ve detoxed my body and balanced my pH. This is my personal experience, and one thing I can tell you–I’m not going back to regular water. Are you ready to try yoga with your dog? While exploring Twitter, I stumbled across the most interesting profile – @DogaYogaMahny from London. Mahny Djahanguiri is Europe’s leading Dog Yoga expert and author of the book DOGA–Yoga for you and your dog. Being a dog owner and yoga lover, I wanted to know all about doga and Mahny was kind enough to answer a few questions about it. Mahny was on BBC’s The Barking Hour yesterday. Listen here. What are the origins of doga? Doga originates from the US. A yoga teacher, Suzy Teitelman, explored doga with her two poodles when she found them wanting to join in her practice on the mat. She designed poses that help encooperate the dog through lifts and stretches. She’s been running classes in Miami since 2006. What are the benefits for the owner and dog? The benefits are the same for dog and owner. As the parasympathetic part of the central nervous system overrides the sympathetic nervous system, both dog and owner will gain a deeper more valuable sleep, release stress, eradicate anxiety and stress related issues, and help digestion and skin disorders. The owner gains a fit body by toning muscles, building core strength, stability, and flexibility. Doga is fun – and through petting your dog, love hormones are released which help you to de-stress. Do dogs ever misbehave in your doga class? Dogs ALWAYS misbehave in my class, that’s part of the doga fun. In Doga I try to encourage people to lose their “ownership,” which is the controlling part and the ego. The more we allow and ignore our dogs conditioned behaviour in a group/pack the more your dog can figure out were he belongs in the pack. Showing anxiety doesn’t help your dogs behaviour issues. Through using yoga we focus solely on ourselves while our dogs “act out” their stress. Once the owner has slowed down their central nervous system the dog will automatically be drawn to this inner stillness. It takes sometimes up to fifty minutes for a dog to stop barking or dominating his peers. But at the end of the session ALL dogs are totally out. How long are doga classes and how much do they cost? A Doga session consists of ninety minutes breathing, yoga poses, relaxation and chanting. A class costs £20 per dog. One can also bring along family members especially children. It’s a group therapy and focuses on bonding with nature. Watch the book launch video here. A special thanks to Mahny Djahanguiri for telling us all about DOGA. Please leave your questions and comments for her below. Find out more DOGA Mahny’s website and Twitter. DOGA-Yoga for you and your dog is available on Amazon. 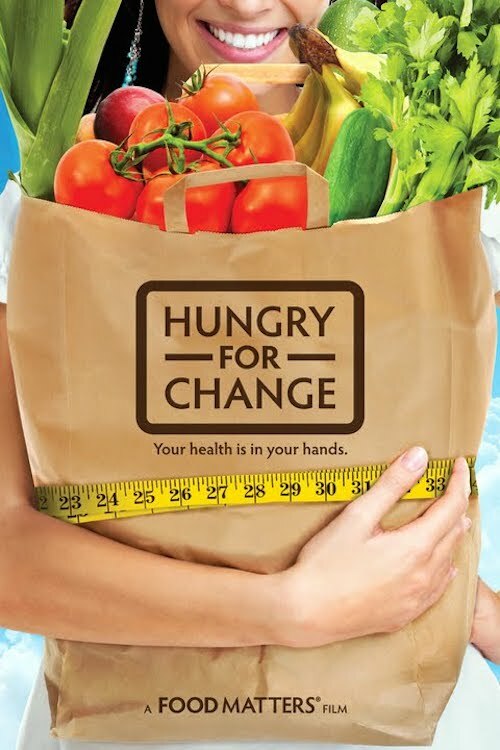 Hungry for Change: Watch Revolutionary Nutrition Movie for Free! This movie will change the way you look at food. Gain free access till May 28th by clicking here. Hungry for Change exposes shocking secrets the diet, weight-loss, and food industries don’t want you to know about—deceptive strategies designed to keep you coming back for more. Find out what’s keeping you from having the body and health you deserve and how to escape the diet trap forever. Featuring interviews with best-selling health authors and leading medical experts plus real-life transformational stories with those who know what it’s like to be sick and overweight, Hungry for Change offers wisdom from those who have been there before, and helps you continue your health journey today.